For some reason, I have never been able to consistently make good lasagna. Part of the reason is probably because I never really used a recipe. 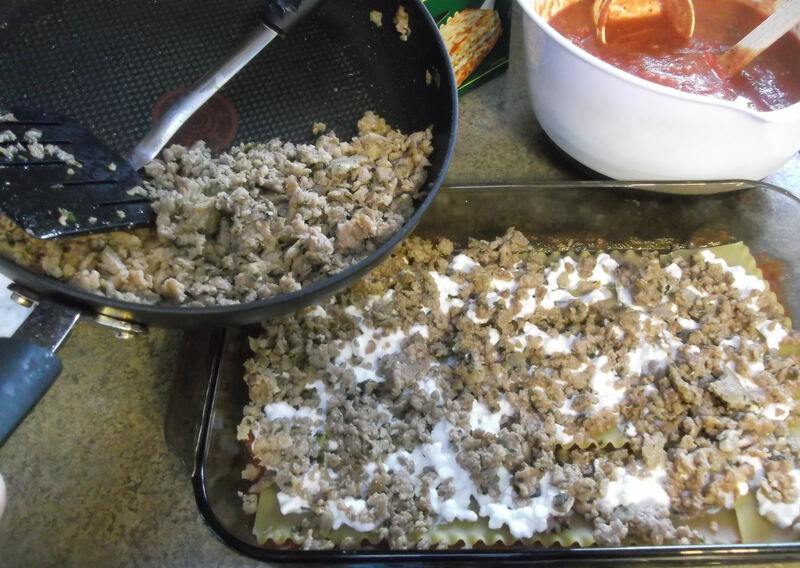 But even when I did, I used the wrong kinds of tomatoes and tomato sauce, and either too much or too little, which made my lasagna either too dry or too wet. So when the RedGold® brand reached out to me and offered to send me their lasagna-in-a-box gift pack with recipes, I jumped at the chance. The package included several recipes, including the one I adapted below, along with the right kinds and quantities of canned tomatoes I’d need to make a completely foolproof lasagna. Their website features other ways to play around and gourmet up this basic recipe, so use this as a base and have fun with it! In a large mixing bowl, combine the crushed tomatoes, diced tomatoes and water. Add salt and pepper to taste. Cover the bottom of a 9×13 baking pan with 1½ C of tomato sauce. 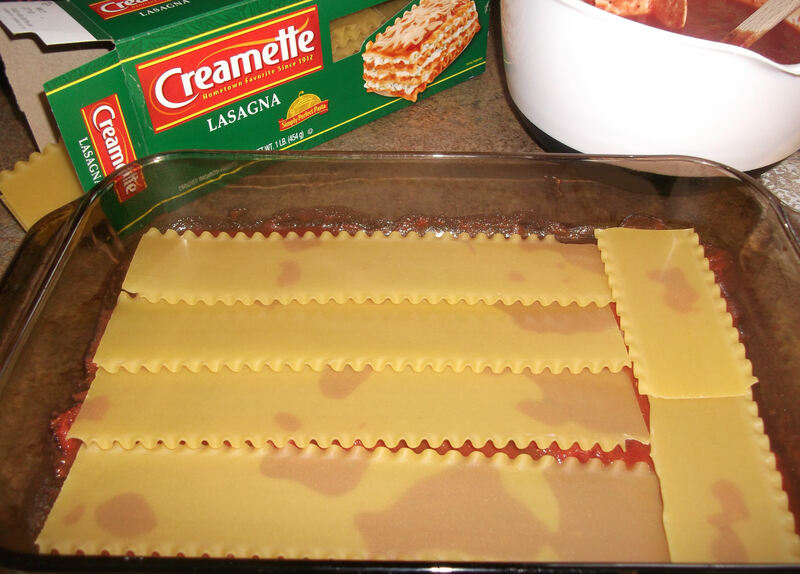 Arrange 1/3 of the box of lasagna noodles on top of the sauce, overlapping slightly and breaking them to fit, where needed. Top the noodles with half of the ricotta cheese (or cottage cheese), then with half of the browned sausage, 1 C of mozzarella cheese and 1 C of tomato sauce. Repeat the first layer: layer another 1/3 of the noodles over the sauce and add the remaining ricotta, the remaining sausage, 1 C of mozzarella, and 1 C of tomato sauce. 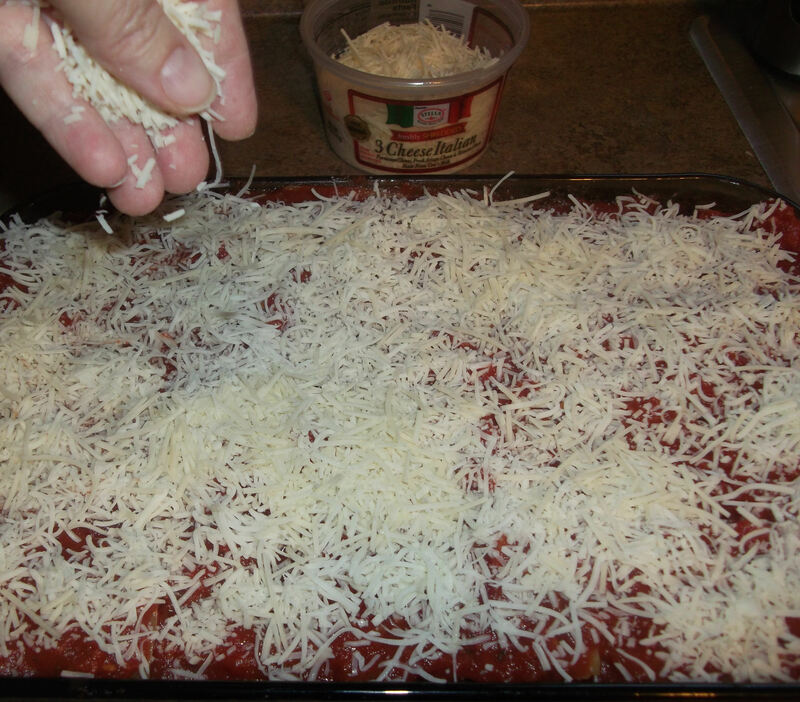 Top this layer with the remaining noodles, cover evenly with the remaining tomato sauce, then cover with the remaining mozzarella cheese and all the Parmesan cheese. 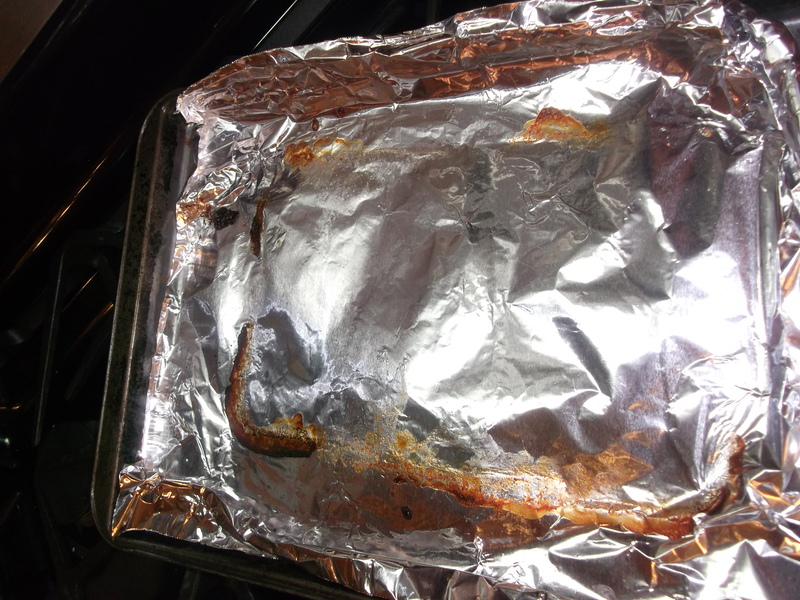 Line a baking sheet/cookie sheet with foil. Spray a large piece of foil with cooking spray and tightly cover the lasagna pan, sprayed-side down (to prevent the sauce or cheese from sticking). 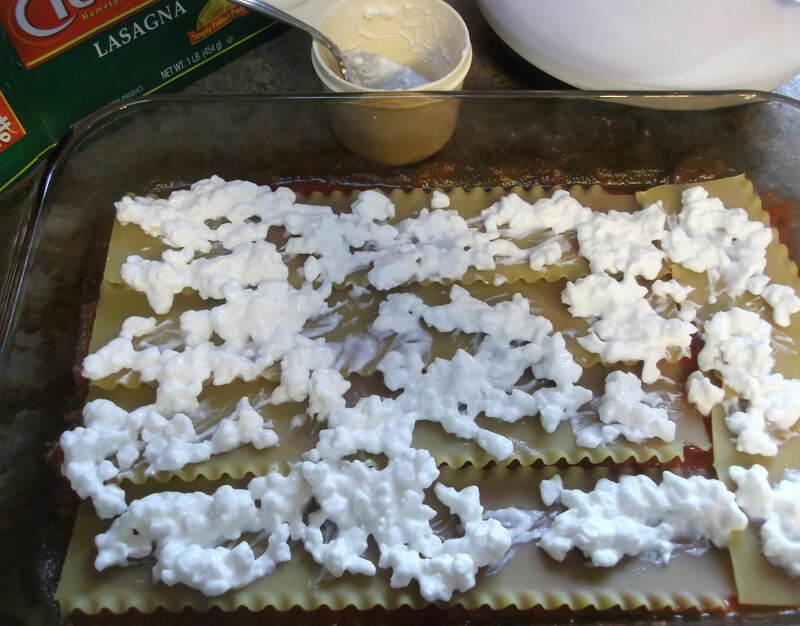 Place the lasagna on the foil-lined baking sheet and place in the oven. 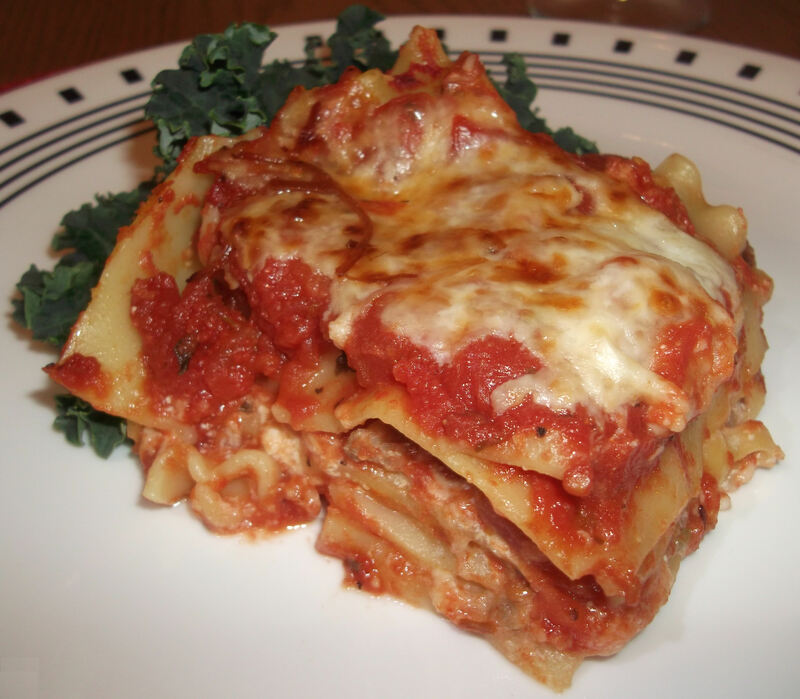 Bake at 350 F for 1 to 1½ hours, or until the noodles are cooked and the lasagna is bubbling. 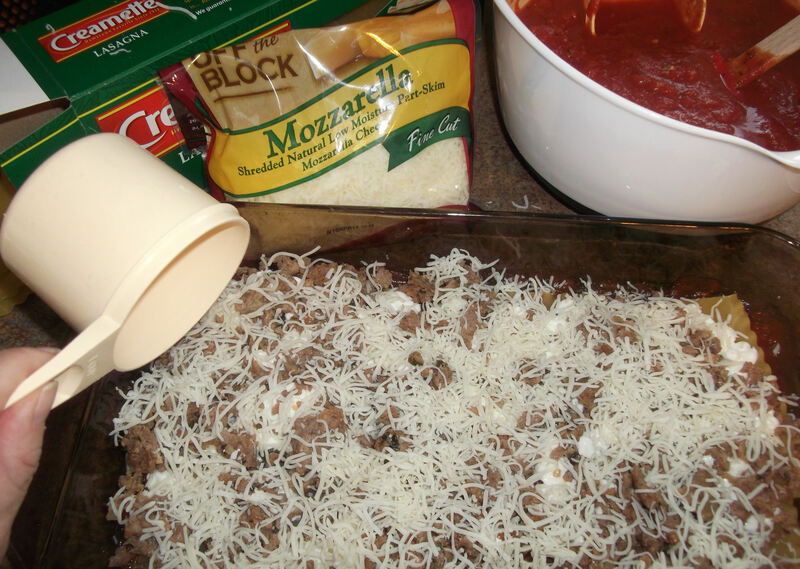 Once the lasagna is fully cooked, remove the foil from the pan, turn on the oven’s broiler, and place the uncovered lasagna under the broiler for several minutes to brown the cheese. Let stand 10 minutes before serving. My RedGold® gift pack came with a recipe sheet, lasagna noodles, canned tomatoes, and a heavy-duty stainless steel spatula that made cutting the lasagna a cinch. Get all the ingredients ready to go. Feel free to use pre-shredded cheeses or shred your own. If you have time, make your own ricotta cheese, otherwise, use your favorite store brand. I used cottage cheese to up the protein content and reduce some of the fat. 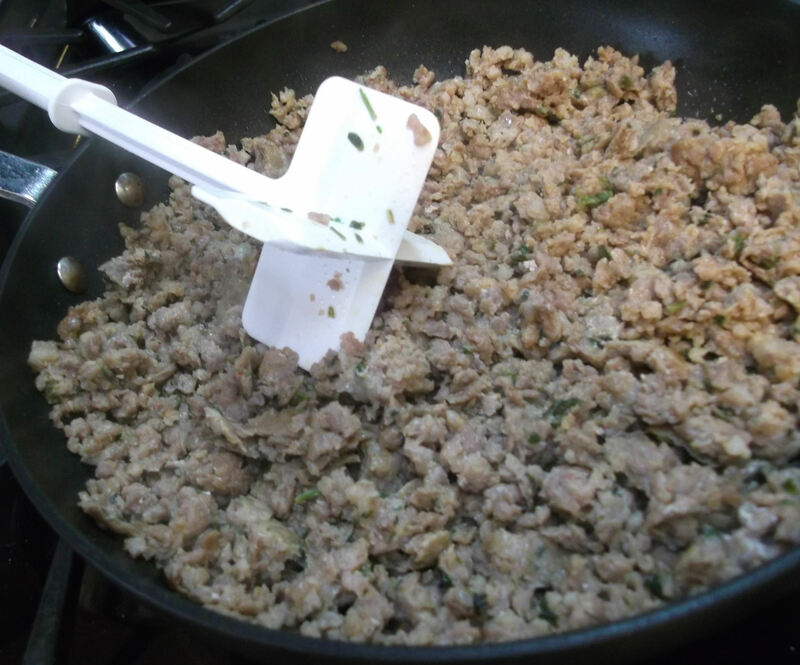 Start by browning the Italian sausage (or ground beef) over medium-high heat, breaking it apart as it cooks. Once fully cooked, drain fat and set aside. In a large mixing bowl, combine the crushed tomatoes, diced tomatoes and water. I poured the ½ C water into one of the empty tomato cans, swirled it around to “rinse” it and pick up any remaining flavors, then poured and swirled it in each remaining can before adding it to the bowl. Add salt and pepper to taste. 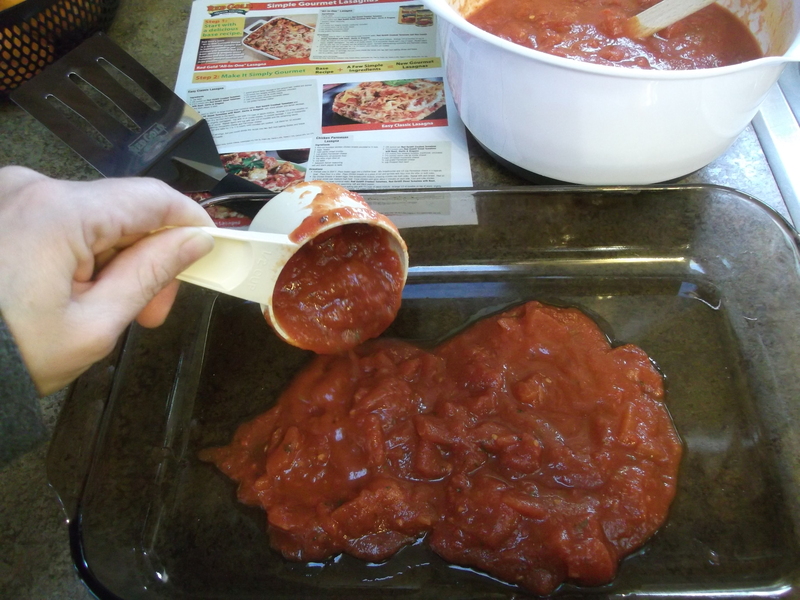 Pour 1½ C of the tomato sauce into the bottom of a 9×13 baking pan and spread it around evenly. Arrange 1/3 of the box of lasagna noodles on top of the sauce, overlapping slightly and breaking them to fit, where needed. Top the noodles with half of the ricotta cheese (or cottage cheese). Don’t worry about completely covering each noodle…it will all melt together when it cooks. Top that with half of the browned sausage. Add 1 C of shredded mozzarella cheese. Then top it off with 1 C of tomato sauce. Again, don’t worry about complete coverage. Now do it again: layer another 1/3 of the noodles over the sauce, then add the remaining ricotta, the remaining sausage, 1 C of mozzarella, and 1 C of tomato sauce. Top this second layer with the remaining 1/3 of the noodles and cover with the remaining tomato sauce. Spread it around to cover it evenly. Top with the remaining mozzarella cheese and all the Parmesan cheese. The next step is to cover the lasagna tightly in foil. Get a piece large enough to cover the pan, and spray one side with cooking spray. Place the foil over the pan – sprayed-side down to prevent the sauce or cheese from sticking – and tightly cover the pan. 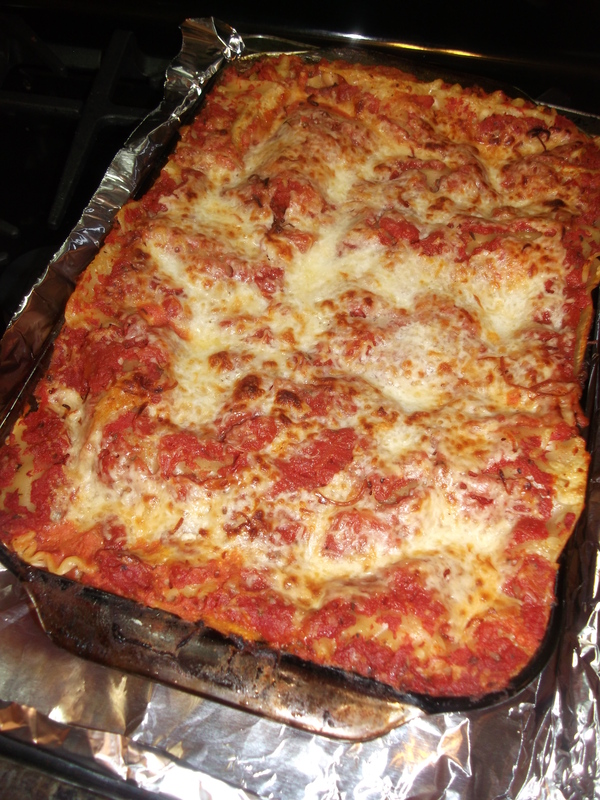 While baking, even if tightly sealed, the lasagna may still bubble over and drip in the oven. For easy cleanup if this should happen, line a baking sheet/cookie sheet with foil. 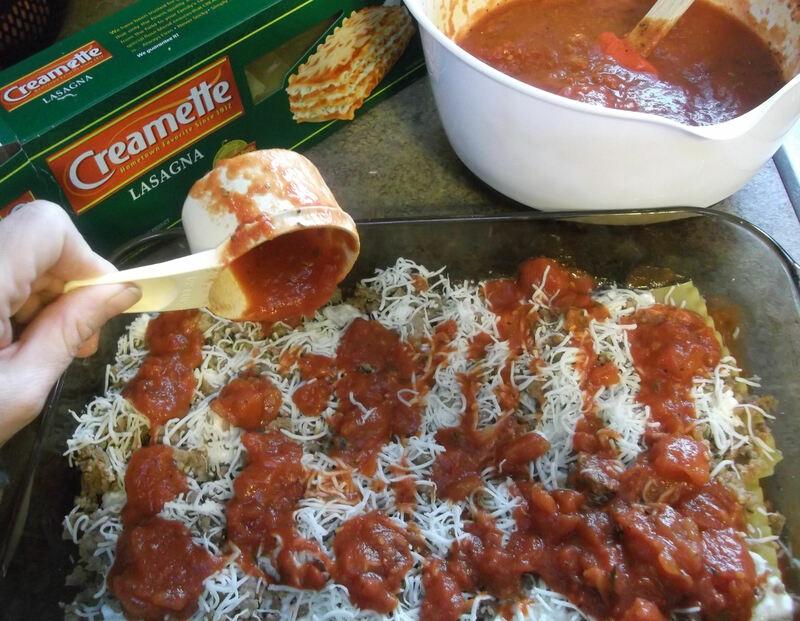 Place the lasagna on the foil-lined baking sheet and place in the oven. Bake as directed. Once the lasagna is fully cooked, remove the foil covering the lasagna. Turn on the broiler and place the uncovered lasagna (still on the baking sheet) under the broiler for several minutes to brown the cheese. Check it every few minutes and rotate as needed until evenly browned. Now didn’t I warn you that the lasagna might bubble over? Here’s the foil I used to line the baking sheet, and all I need to do is ball this up and throw it away. The bottom of my oven stays clean and my house is filled with the enticing aromas of tasty lasagna, not of scorched and smoking drippings! 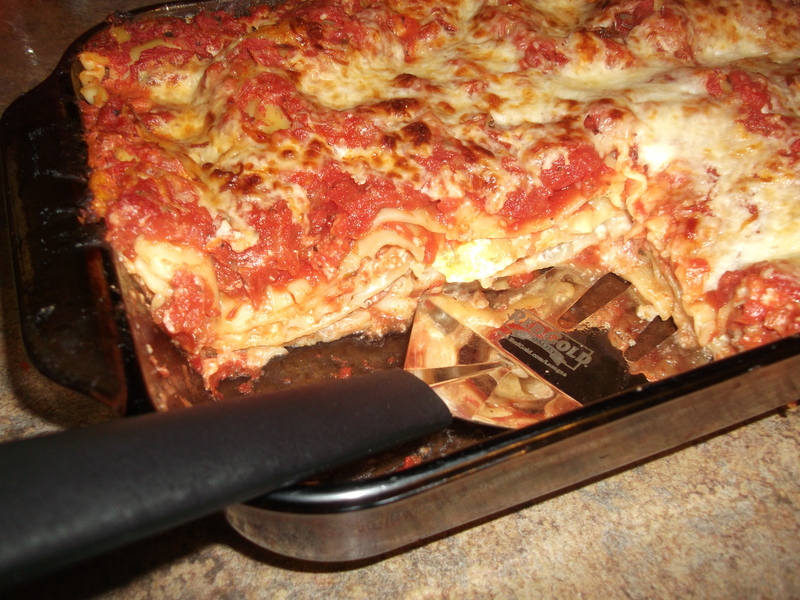 Let the lasagna stand at least 10 minutes before serving. Use a knife or heavy duty spatula to cut it. Nice recipe 🙂 but in my opinion home-made lasagne is so much more delicious..